A few weeks ago I informed readers of our new Members Affinity Scheme, something I had been thinking about for four years and have finally found the time and resource to get off the ground. The logic behind the plan is simple; local independent retailers offer worthwhile incentives for Conservative Party members to use their shop in preference to the large chain stores nearby. This will hopefully drive footfall and new business, often at quiet times of the trading week, whilst we are finally in a position to offer a real tangible benefit for our local members. This is not new - many years ago the party nationally offered something similar, but discounts on cases of Claret from Berry Brothers and 5% off 1st class airline travel did little to dispel the unfair image that we were an elitist club, whilst adding no real value for the overwhelming majority of our members. I am delighted to report that the West Kent scheme is exactly the opposite. We have a car garage & motor spares, pet food supplier, fish & chip shop, card & gift shop, hairdresser, nail bar & beautician, shoe repairs & key cutting, DIY/Hardware store, printing & photocopying shop, carpet fitters, florist, dry cleaners, Indian restaurant and car hire. These are a great selection of local independent retailers that people use on a daily or weekly basis. A fantastic scheme which will promote local business whilst offering substantial savings to our members of between 5% and 20% on usual prices. 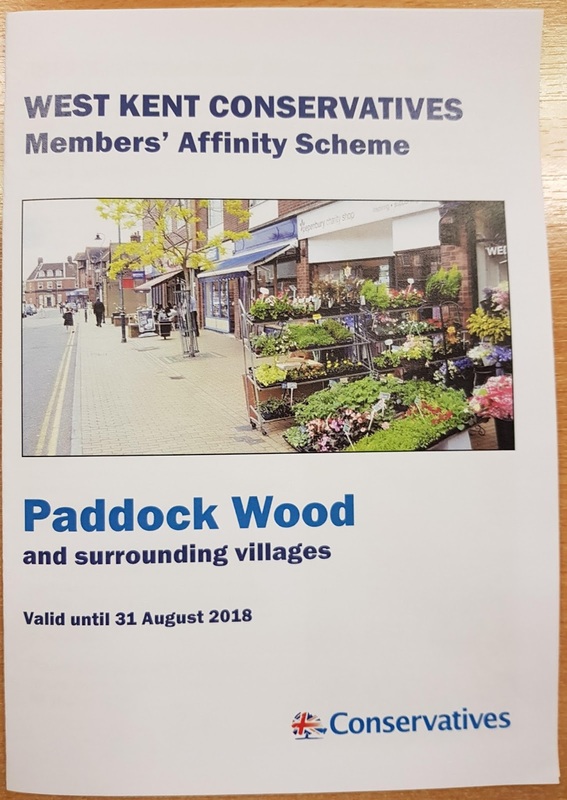 We have produced a full colour booklet listing all the participating retailers and the discounts they have offered, along with a foreword from local MP, Greg Clark, who will be launching the scheme at a reception in Paddock Wood in September. Around 500 local Conservative Party members and donors will receive the booklet along with a covering letter and their personalised "Blue Discount Card" in the post next week. We will then follow this up with a major recruitment campaign aimed at the 2,500 pledges we have in the towns and villages nearby. If this trial scheme is a success, our aim is to roll it out to other towns and villages next year. There are many advantages to "grouping" but having both the technical ability and the confidence to launch a scheme such as this is one of the benefits which is seldom discussed or acknowledged. I am confident that the Blue Card will help local independent retailers, reward our members for their support and finally give us a recruitment tool which I hope will make it much easier to recruit new members and donors. As always, I will keep readers informed about progress. Ensure members have a choice and don't just have to settle on who happens to be available. 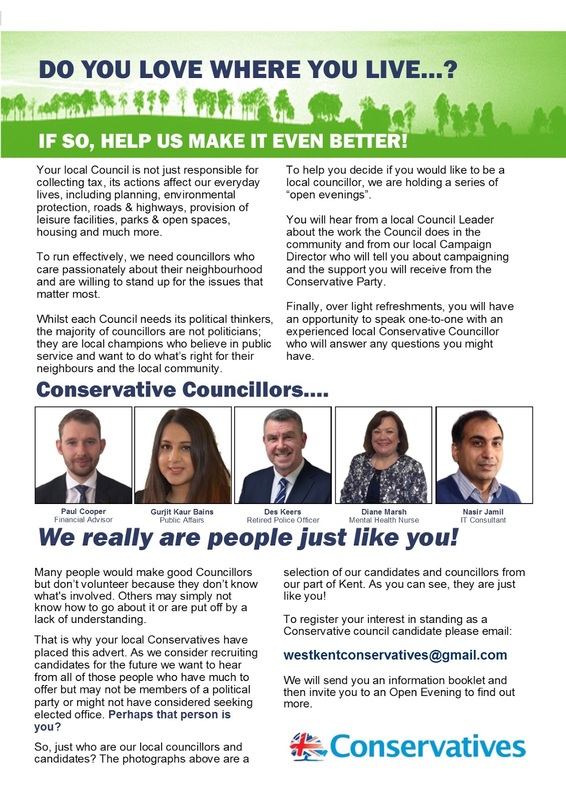 Councillors are often arm-twisted into standing "one more time" as there is no-one else available, and too often we have to re-select councillors who clearly don't perform or fulfil their campaign obligations as there is no choice. In West Kent we have a mixed bag locally. 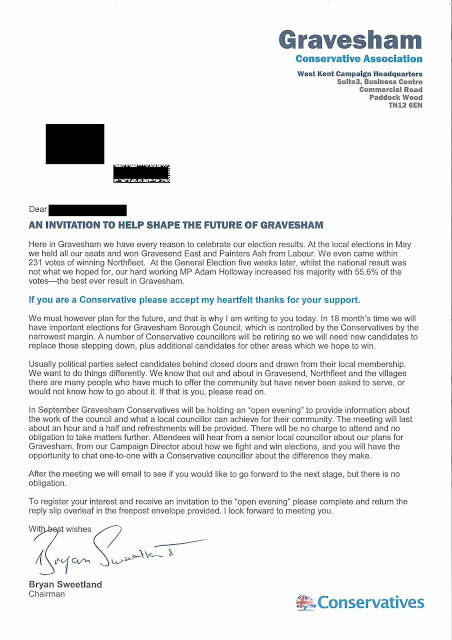 Two of my Associations are absolutely ruthless at not just refusing to put weak applicants on the "approved list" but also removing non-performers (and this includes those who do not support their branch or campaign towards the association's wider political goals - including campaign support elsewhere). At the last round of selections in one particular Association almost 20% of incumbent councillors either "jumped" before they were pushed or were removed from the "approved list" by the Approvals Committee (with not one successful appeal, as I always ensure the process is followed to the letter). Many Associations fear removing poor performing councillors due to the effect this has on morale. Locally, we have few if any concerns about this. The overwhelming majority of councillors pull their weight both in terms of their support for the Association and with campaigning - and they are rightfully as irritated as the rest of us about their non-performing colleagues. Almost certainly, if a councillor fails to pull their weight with campaigning, fund raising and political activity, they almost always similarly fail to pull their weight with casework and council related business too - resulting in an unfair additional burden on their colleagues. The ability to bring forward a new generation and retire those who don;t pull their weight is of course dependent on having a ready supply of new applicants. This involves constant work on identifying and recruiting potential councillors throughout the year, and not leaving it until four months before polling day before realising you are short of local talent. Some of our strongest and most effective councillors in West Kent are people who were not previously active: community leaders, campaigners, local activists and neighbourhood champions. Many did not see themselves as 'political' and few if any would have ever come forward to be a candidate had we not "reached out" beyond our traditional membership base and asked them to do so. The Rt Hon Ann Widdecombe was one of the most popular and formidable politicians of her generation, representing Maidstone for twenty three years from 1987 until 2010. During her time in Parliament she was Minister of State for Prisons, then between 1997 and 2010, Shadow Secretary of State for Health and Shadow Home Secretary. Upon retiring from Parliament in 2010 Ann moved to remote Dartmoor and launched a successful new career as a writer, columnist, TV personality, star of pantomime and Strictly Come Dancing! Throughout this time Ann has continued her steadfast support for the Conservative Party both nationally and here in Kent, returning regularly to campaign at election time and support our local fund raising. This includes being “President” of the West Kent 500+ Club which has raised almost £25,000 for local Association funds over the last two years. We are delighted that Ann has agreed to be interviewed about her remarkable life at the next in our series of “An Audience with…” This will be held on Thursday 2 November 2017 at Shorne Village Hall, 16 The Street, Shorne, Gravesend DA12 3EA. Doors open at 7pm with the show commencing promptly at 7.30pm. After being interviewed about her remarkable life and answering questions from the audience, Ann will conclude the evening by drawing the winning numbers for the November and December 500+ Club, with almost £5,000 of prize money being presented to the lucky winners. For many years I have been looking at ways to thank and reward our members for their support. Tangentially, I have also been working with various local councillors to encourage residents to "shop local" and support their independent retailers. Then six months ago I realised the two could be directly linked: a Members' Affinity Scheme which would both reward members for their support, encourage new members to join and, at the same time, drive footfall towards Kent's many independent small shops and businesses. After a great deal of hard work, we are about to launch our Members' Affinity Scheme. The trial is taking place in Paddock Wood (where West Kent Towers is situated) and where, I am delighted to report, sixteen of the towns 20 or so independent retailers have "signed up" to participate. If the trial is a success we hope to roll it out in other areas. The key is to give the retailers maximum choice in the size and scale of their offer. Some have used it to drive business on quiet days (10% discount on Monday, Tuesday and Wednesday). Others to up-sell (complimentary pudding if you buy a starter and main course). Some have simply given a wide discount which can be used any time. Importantly, we have also attracted a wide variety of general retailers (not exclusive suppliers which are out of reach for many shoppers). Participants include a pet shop, hairdresser, dry cleaner, card shop, Indian restaurant, nail bar, hardware store and print shop. Businesses that almost every local shopper will use on a weekly basis. We will be officially launching the scheme in September at a reception hosted by Greg Clark MP with local participating retailers and community leaders invited as guests. At the moment our sixteen retailers are signing off their artwork, before the brochure goes to print. Once the scheme is up and running we will send a discount card to all those members in the surrounding catchment areas then follow up with a membership recruitment campaign to all local pledges, citing the discount card as a reason for joining. Will it work? It will certainly do no harm, and until we try these things we will never know. 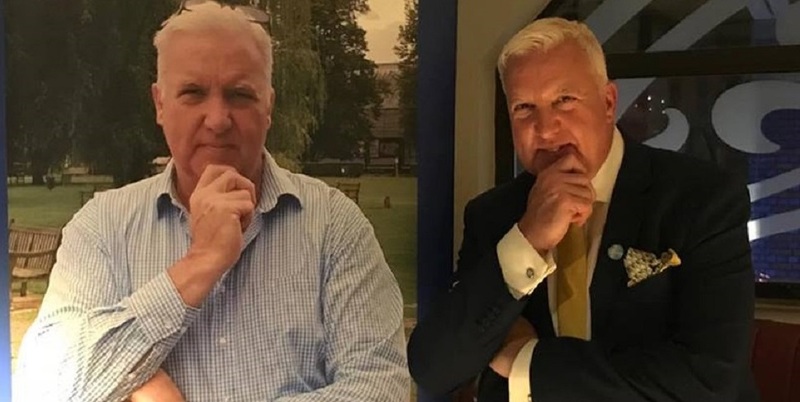 I am pleased to see that local Tonbridge UKIP activist, Dave Allen, is one of the 11 applicants to lead UKIP into post-Brexit Britain. Dave is a published author with works including "The Sophisticated Alcoholic" and "Memories of the Afterlife" to his name. I am sure UKIP will benefit from someone with such intellectual prowess at the helm. He is also an expert on Emotional Freedom Technique (Tapping). An "easy to use healing tool which provides the foundation for expanding one's emotional freedom." If any of my readers are in need of having their emotional freedom expanded, I recommend the 4 minute YouTube video below. Good luck Dave, UKIP needs a normal, hardworking grassroots activist at the helm. This will be held from 4.30pm - 6pm on Monday 2nd October 2017. This is the eighth year we have hosted an Afternoon Tea, which is becoming a 'must go' event due to the exclusive and unusual venues we choose and the high quality of the catering provided. For Manchester 2017 we are returning (by popular demand) to the award-winning Richmond Tea Rooms. Tickets are £25 per person for a full Afternoon Tea including a glass of Champagne on arrival. Please note: booking and payment must be received by Friday 22 September 2017. This is necessary as regrettably in previous years a number of people have said they would attend and then failed to come on the day. 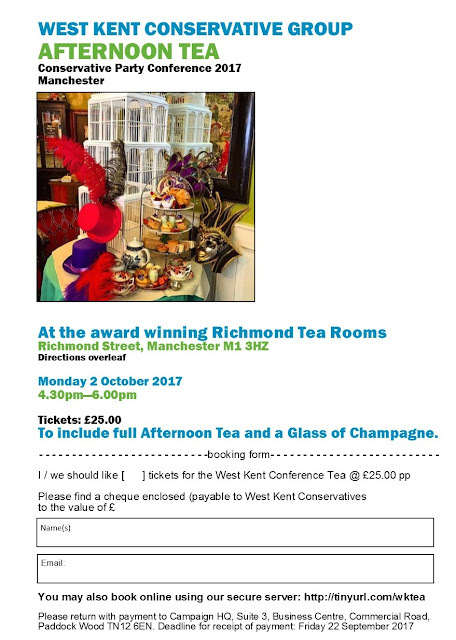 This has resulted in the event losing money and needing to be subsidised by West Kent Conservatives. This is a social event, not a fund raiser, and we only charge for tickets what we are being charged by the venue.